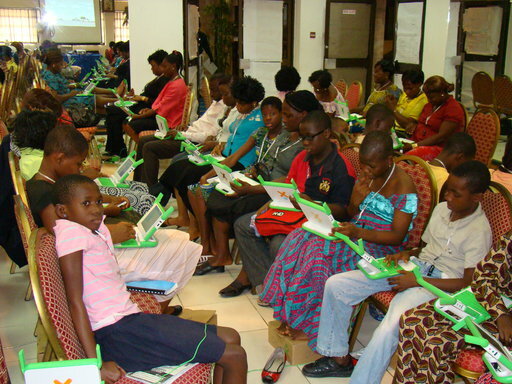 Earlier this month, I found myself embarking on a last-minute journey to a One Laptop per Child workshop in Port Harcourt, Nigeria. They are preparing for a 6000 XO laptop deployment in that region of the country. I attended to support the 5-day event, which was coordinated by Michael Tempel and Claudia Urrea. The laptops were donated by Rusal/Alscom, and the deployment will be primarily run by Schlumberger’s Excellence in Educational Development division. SEED already uses its local staff to run some education projects in Nigeria (and many other countries). We covered a range of activities including Write, Record and Paint, then spent a decent amount of time on TurtleArt and Scratch. We also handed out 75 sensors and ran some activities around the measurement of humidity, temperature and light. The abilities of the attendees (the vast majority of which were first-time users) grew very nicely during the workshop. 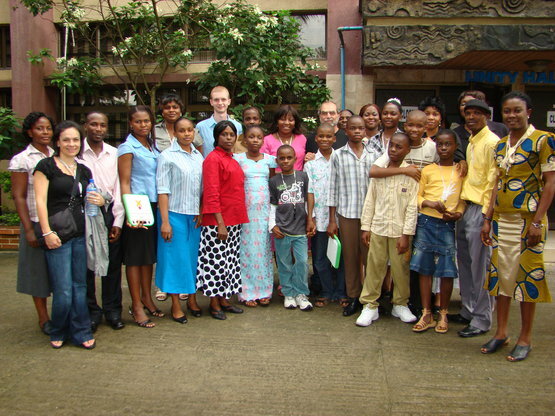 The group consisted of about 80 teachers and 20 children. Both the size of the group and the wide age range presented some challenges. Usually, such workshops would be run only with the core teams behind the deployments (a smaller group overall), but the way that things are developing in Nigeria meant that it made more sense for us to work with a larger group at this time. One of the biggest stumbling blocks of the workshop was working with the Scratch activity – while a very valuable activity, its integration with the Sugar desktop environment is damagingly minimal. For example, instead of using Sugar’s simplistic “Journal” storage system, it presents regular-looking Load and Save dialogs which proved very challenging for the new users. Seeing people struggle with interfaces that we see all over the desktop computing world really reminds you just how ground-breaking and significant the simplicity of Sugar is. We also ran into some problems with the Paint activity regularly freezing the systems, unreliable saving/loading with USB disks, and some confusion relating to Measure’s sensors interface. We were kept on our feet at all times, meaning that I didn’t really have time to sit down and diagnose the issues in detail, but they should not be hard to reproduce at a later date. The issues were not significant enough to cause any major disruption. I ran a few technical sessions with a few people who will become the basis of the technical team, plus some interested volunteers and teachers. As I’ve seen in other places, this was challenging because prior experience with Linux is low and internet access is scarce, so “look up this topic on the OLPC wiki” is not an answer that everyone is able to work with, and “run this command at the terminal” requires a decent amount of explanation. Nevertheless, the enthusiasm is overwhelming (as always) and I went away feeling confident that the core team is now comfortably in a position to get things moving and pass on knowledge to a wider group. Our hours were cut short by the high security around us, meaning that we didn’t have much non-workshop time to interact with the attendees (or really see the country at all), but overall it was a lovely group to work with and I’m confident that we’re going to see great things come out of their efforts. I’m now back in Nepal until November. 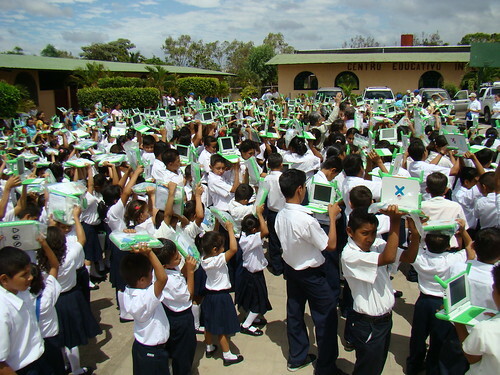 I wrote up a summary of my experience in Paraguay, you can read it on the OLPC wiki. Last week, I gave a presentation about OLPC in the field at an OLPC UK meeting. It went well and it was nice to meet everyone for the first time. They are planning an exciting pilot deployment in a London school. I’ll leave them to announce the details as things progress. The development of the XO-1.5 software release is progressing nicely. We have automated builds that work reasonably well. And now would also be a good time to mention my upcoming plans; on July 18th I will be flying out to Nepal to spend 12 weeks as a volunteer for Open Learning Exchange Nepal, the organisation implementing One Laptop per Child in that country. Exciting! The OLPC tech team recently flew out to Quanta in Taiwan to bring up the first handful of test boards for the next generation XO laptop, known as the XO-1.5. The new laptop is basically a refresh to solve the difficulties that occur when you continue to try and source 2-year-old technologies in bulk, but will result in core improvements at the same time. The Geode processor from the XO-1 has been end-of-lifed; the new laptop uses a VIA C7 CPU with the brand-new VX855 chipset. The flash storage and RAM have been quadrupled, providing 4GB and 1GB respectively. I’m now joining the efforts for a few weeks, helping out on the software. We’re aiming to make a new “deployment quality” software release, including the newer version of Sugar and a generally more-up-to-date system based on Fedora 11. I received my A-test board today, it is already booting into Sugar and is quite functional. 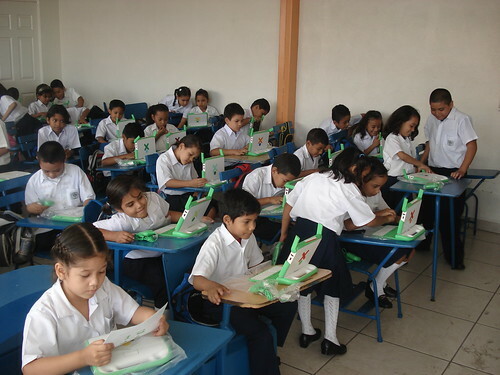 A while ago, I created an OLPC UK page on the OLPC wiki, and a mailing list alongside it with the hope of linking together the various people who were interested in organising various kinds of UK-based One Laptop per Child activities. These small efforts have proven fruitful; a number of people from various backgrounds have teamed up and are organising a pilot programme for deploying a small number of XO laptops in a UK school. I’m back in the UK for a little while and am excited to get involved where I can. Their next meeting is June 17th in central London. 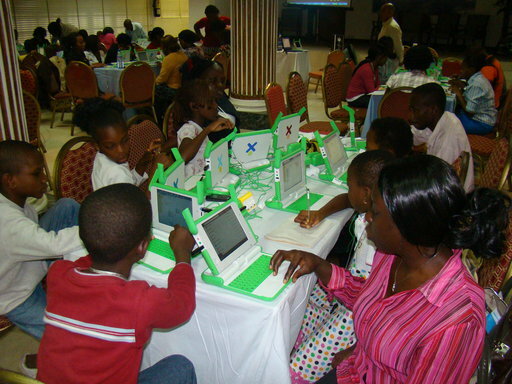 I will be giving a presentation about my experiences with OLPC to date. More details here (RSVP requested). I hope to see you there!